Glowy: Ik Ogbonna In Giuseppe Zanotti Black Chain Fringed Plimsolls And Sonia Lareinaa In Tory Burch Reva Ballet Flats. Ik Ogbonna In Giuseppe Zanotti Black Chain Fringed Plimsolls And Sonia Lareinaa In Tory Burch Reva Ballet Flats. Ik Ogbonna was seen all loved up with his new wife Sonia in Belgrade, Serbia yesterday. He wore a denim hood jacket on a white t-shirt with a black denim jean while he then finished up with a Giuseppe Zanotti Black Chain Fringed Plimsolls. His wife Sonia wore a denim shirt which could also pass for a jacket which ever way you rock it with a denim jean trousers and then finished up with a Tory Burch Reva Ballet Flats.. 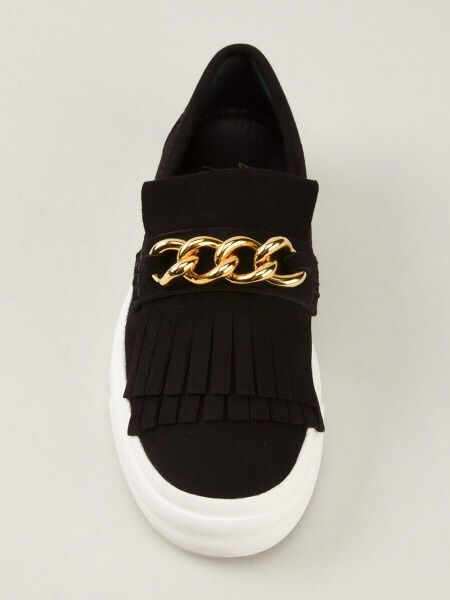 The details about this shoe that i love is the bright colored leather and shiny gold buckle add just the right amount of color to any outfit. Hope you have a great start of the week. Well you said it all,stylish couple!emmm glowy please bring us shoe's from the recent BET AWARD'S.. I love his chain slip on!!! I am beginning to like this two. But glowy they aren't married yet na.